Looks like college students have to go back to stealing. Ruckus Network, one of the major players in the DRM-ed "free music" download space that targeted universities, closed shop over the weekend. The Ruckus Network, owned by TotalMusic LLC, launched in 2004 at Northern Illinois University, was the first of its kind, and one of the first to die. Ad-supported Ruckus partnered with over 80 campuses and offered "free music" to subscribers. University campuses have always been a hotbed for online music piracy. 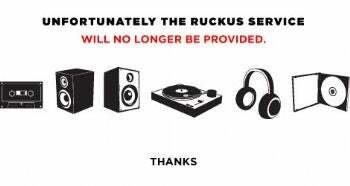 In an effort to curb campus music theft, Ruckus was born, and for a while, kept schools happy -- both students and administrations avoided legal troubles. But there were numerous problems with Ruckus. Its flavor of DRM only played nice with Windows computers, and with the rise in popularity of the Mac, this posed a problem to many students. Also, because the DRM wasn't compatible with Macs, it also didn't work on iPods. Without the ability to transfer music from your PC to an iPod, what's the point? Ruckus' popularity plummeted. "I only hope that someone else figures out how to crack this music-on-the-web nut in a way that is a win for everyone in the value chain. The problem is that to make a music service a win for everyone, then they all of the famished participants have to sit at the table - and be content to let all the others have a little bit to eat, even though they are still hungry themselves." The big question now is whether Ruckus is the first of many ad-supported free music sites to close. Pandora, anyone? This story, "The Day the Music Service Ruckus Died" was originally published by PCWorld.